It has been SO hot! I know we have not had the extremely high temperatures that many places have, but 90 is very hot for us mountain folk. 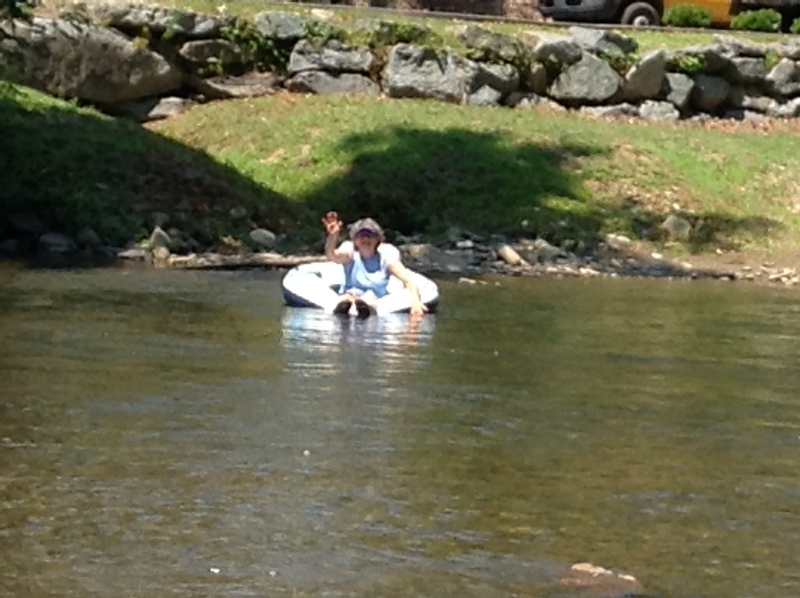 So, Phil and I took some of our grandchildren to the river. 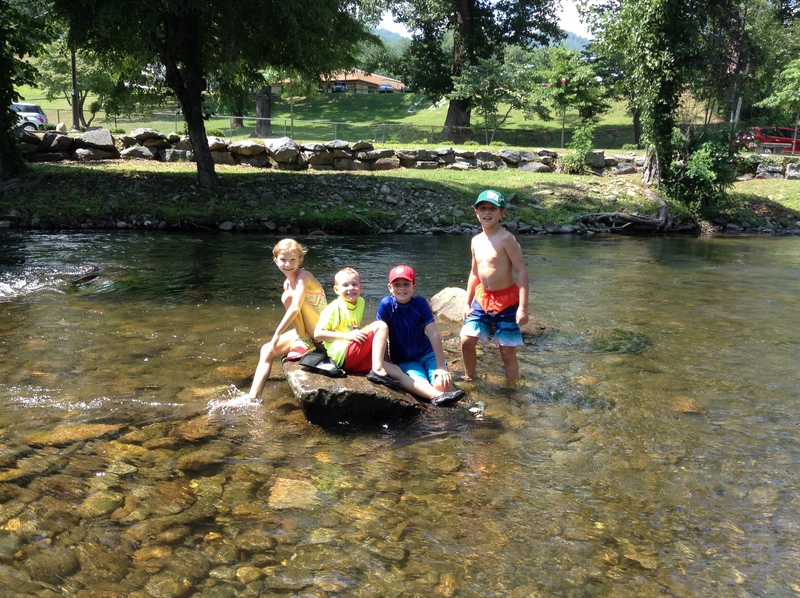 Getting in the cool water that flows from the Great Smoky Mountain National Park was so refreshing! We brought tubes and some of us floated in the cool wetness, while others stacked rocks, threw rocks, or just played in the water. As I floated, leaning back on the headrest of my tube, I found myself reflecting on just how lovely it felt to relax in the coolness of the river. It was refreshing, something I needed after the heat of the day. I also need spiritual refreshing from time to time because of the stress (heat) of life. It builds up, just as heat does, and we can be overcome by that pressure without realizing it. 37 On the last and greatest day of the festival, Jesus stood and said in a loud voice, “Let anyone who is thirsty come to me and drink.38 Whoever believes in me, as Scripture has said, rivers of living water will flow from within them.” 39 By this he meant the Spirit, whom those who believed in him were later to receive. Up to that time the Spirit had not been given, since Jesus had not yet been glorified. Rivers of living water flowing from within! This refreshing, flowing, continuous LIFE comes from the Holy Spirit. When I feel overwhelmed, discouraged, even defeated spiritually, I must allow the Holy Spirit to flow in and through me. This living water, the Holy Spirit, is received when we become Christians, and dwells within us. Just as the cool water of the river refreshes me physically, God’s Holy Spirit refreshes me spiritually. May we be faithful to let the living water flow. Our tech guy was explaining to me why he was checking the power source and connection of my classroom computer. I breathed a sigh of relief when my computer was in fact on. I did spend about 20 minutes one day because my computer wouldn’t take my password. A co-worker came by and noticed that the computer was logged in to the substitute I had while attending a workshop. I logged myself in and AMAZING – it took my password! SO GLAD I hadn’t called the tech guy! Do we do this as Christians? Do we run to someone for help, when we aren’t even connected to the Power Source? No matter what we are facing in life, we can have hope, joy, and peace if we are connected to the source of power. This promise is for each of us – and for our children! Later in this chapter, we are told how to STAY connected. Acts 2:42. These four disciplines will assure that we stay connected to the source of power. Attending a women’s Bible study addresses each of these disciplines for me. Biblical Teaching – We study God’s word together. I am always blessed by insight from God’s word that various women share, often truth that I see in a new light. Fellowship – The fellowship is encouraging and such a blessing! Women of various ages and different churches and backgrounds attend. I have met women I would never have met apart from this fellowship. We share food once in a while, which is always nice, nourishing our bodies and souls. Prayer – we pray for each other after sharing requests each session and also pray during the week. If you are not connected to the Source of Power, consider attending a Bible study. There is often child care available for mothers of young children. 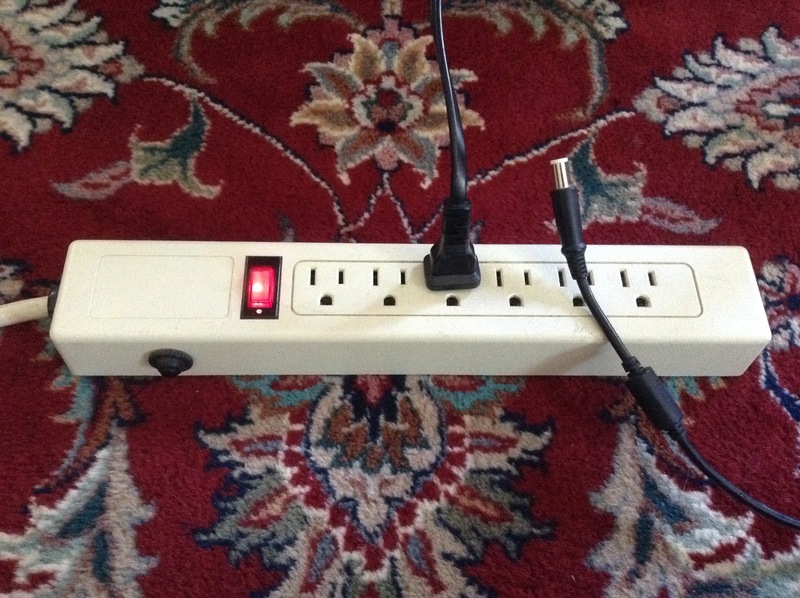 Let’s get plugged in and stay plugged in to Jesus, the source. We bought a new car and recently took it in for its 5000 mile check up. That may be no big deal to most folks, but I am married to a “do it yourself” kind of guy. It was a momentous occasion! We bought our first new car after being married over 25 years and never took it in for check-ups. Phil did all the oil changes himself and we drove it until it had 187,000 miles. I would probably still be driving that little car, but I was hit in the school parking lot (by one of my students) and the insurance company determined it was a total loss. So, why did Phil take this new car in to the dealership for a tune-up? It was FREE! When we bought our new car one selling point was free oil change and service including tune-ups. So, when the light comes on saying “Maintenance Required” – we drive to the dealership! Our daughters’ Sunday School class is beginning a study on the Holy Spirit and it started me thinking about my spiritual well-being. As a Christian, how do I know when it is time for a tune-up? Am I heeding the “warning light” of the Holy Spirit? Am I the kind of person who waits until something goes terribly wrong before I do anything about it? Or am I the kind of person who notices a change and checks it out right away before something worse breaks down? Am I the person who does scheduled preventative maintenance BEFORE something goes wrong? A light doesn’t illuminate my forehead with a warning of an impending breakdown – although my face may show it. Are there warning signs that should be heeded to prevent a complete spiritual breakdown? The following may be possible hints that a spiritual tune-up is needed. •	Do you feel that things are a bit slow spiritually? •	Do you feel that you aren’t finely tuned to hear the Holy Spirit speak like you once were? •	Do you sense a lack of joy? •	Are you lacking patience with your children? •	Are you and your spouse arguing about little things? •	Do you feel run down, like you aren’t fully connected to the Power Source? These can all be signs that things are out of line. Just as cars don’t run optimally when something is out of whack, we as Christians don’t function well when our thoughts and actions don’t line up with Scripture. In Amos 7: 7-8 God gives a vision to His prophet Amos. God uses His Word as a plumb line – a mark by which we can determine if we are living our lives in line with God’s purposes. Just as builders use a plumb line to see if the building is constructed according to specifications, we can use the Bible to ensure that our attitudes and actions line up with Scripture. So – when it is time for a tune-up spiritually, what should we do? Go back to the Source of our spiritual strength – the Holy Spirit. Just as cars need oil changes, we need the oil of the Holy Spirit to refresh us. The more we die to our selves, the more the Holy Spirit comes in to fill our lives with Himself. Let’s not forget to get those spiritual tune-ups. It will not only bless us but our children and families as well!